California Psychics Review 2019: Legit Readings or Just Scam? California Psychics Review – Real Readings or Scam? 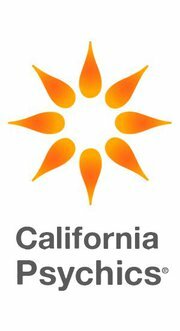 California Psychics is an online psychic website dedicated to helping their clients live the best lives they can. Founded in 1995, the network prides itself on providing affordable, reliable, and quality readings. They intend for their guidance to enlighten clients and give clarity in all matters of life. If you’re looking into getting a psychic reading, you’re probably assessing many choices. And if it’s your first, you want to make sure you put your faith in a company you can trust. What makes California Psychics different than other online psychic resources? We’ve taken an in-depth look at the company’s offerings so you can decide if they’re best for your next reading. 1 How Does California Psychics Work? 8 Final Thoughts: Is California Psychics Right For You? Unlike other psychic providers, California Psychics exclusively does readings by phone. Primary topics they cover. This can include love and relationships, deceased loved ones, past lives, etc. Their primary job descriptions. They might be a dream analyst, clairsentient, clairvoyant, empath, etc. Once you find a psychic that fits your needs, you should create an account (or login with Facebook). Then simply enter your payment information at checkout. Call the number listed on the website and dial the extension of your chosen psychic. Then your reading begins. You can also call their customer service line. By choosing this option, the company places you with a psychic. A representative takes your requests and pairs you with a good fit. It is recommended that you take the call in a quiet, private place. You want to feel comfortable enough to focus and not hold anything back. Prior to the call, they recommend you take a couple of deep breaths. This helps you prepare for a deeper connection with the psychic. Never had a reading before? You should go into the phone conversation with an open mind to get the best results. It is perfectly normal to be skeptical. But you should put forth the effort to make a connection with your psychic. Do not try to guess what your psychic is going to say before they answer your questions. Keep yourself open to ideas you had not previously considered. Always remember that you are free to ask anything. Opening yourself up will help ensure you receive accurate answers. You’ll get the most out of your money. California Psychics uses only experienced and qualified psychics for their readings. They’ll assure you the investment was worthwhile. No matter what tier they are at, all psychics go through rigorous screening. It is worth noting that their process is so rigorous that only 2 out of every 100 psychics that apply are accepted. An important responsibility of qualified psychics is their dedication to privacy and confidentiality. Their phone psychics cannot pry into your mind. They won’t force you to do anything you do not want to do. They will keep the conversation you have with them confidential. This is all to ensure that their clients get the best, most accurate readings possible. Love Psychics. This kind of psychic knows everything there is to know about love. If you have been single for a while, they’ll be able to tell you why you haven’t been able to settle into a relationship. Your psychic can even give you advice on how to go about finding your soulmate. Love psychics can also be helpful if you are already in a relationship. They will give you reassurance. They can confirm your worst suspicions if you think your significant other if being unfaithful. You and your partner might just be going through a rough patch. Your psychic can help you determine the best way to navigate your relationship. Tarot Readers. An experienced Tarot reader uses a deck of cards to tell fortunes. After your reading, you will have helpful insight into your past, present, and future. Empaths. These kinds of psychics are born with the unique ability to feel your emotional or mental state. Because they can form deep bonds and connections, they are perfect for guiding you through a difficult time. Empaths will help uncertain things become clear, instill you with optimism, and reveal new possibilities. Clairvoyants. Clairvoyants are able to see events in the future. This kind of reading will assist you understand your destiny. It can help foster new wisdom. Mediums. Mediums have the ability to channel spirits and make contact with the deceased. This kind of reading is perfect for those who wish to communicate with loved ones who have passed on. Like with tarot readers, mediums give insight into your past, present, and future. Pet Psychics. Pet psychics can help owners gain closure in the event of the loss of a beloved pet. These kind of psychics help owners in understand the feelings and emotions of animals. For instance, they can determine why a pet is not eating or is suddenly exhibiting odd behavior. If your vet is stumped about what is going on with your pet, a pet psychic might be able to step in and provide an accurate analysis. 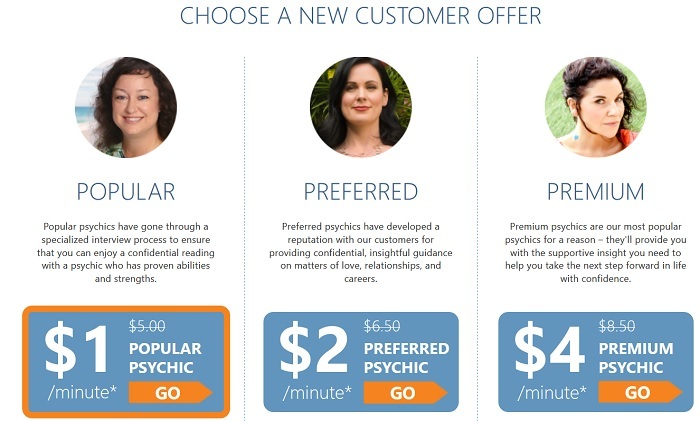 As psychic reading providers go, California Psychics is reasonably priced. The introductory offers they have for new customers are especially good deals. The popular package is $1 per minute, the preferred package is $2 per minute, and the premium package is $4 per minute. Even though they are priced differently, each package will give you an accurate reading. Their differences have to do with what psychics work in each one, what their specialties are, and how in-demand they are among customers. The Popular Package. Like with all readers at California Psychics, the readers that are part of the popular package go through an extensive vetting process. You can expect a compassionate, thorough, and precise reading when using a psychic from the popular package. These readers are only priced lower because they are new to the company. They are generally are not as demanded among the clientele. The Preferred Package. The readers in this tier have built strong connections with customers at California Psychics. People consistently go to them for readings because of their reputation as accurate and insightful. Some fields they are known to specialize in are love, relationships, and careers. The Premium Package. Much like the preferred package, readers who are part of the premium package are in high demand. They are known for being particularly experienced. They will instill you with the confidence you need to tackle the major problems in your life. Psychics have to go through an extensive screening process. This makes them qualified and trustworthy. Introductory rates for new customers are much cheaper. This applies to not only the company’s regular prices but also other competitors’ prices. Many different kinds of readings are available. Customers generally leave positive feedback and there is a high return rate. New customers often received the advice they were looking for and come back for additional consultations. This results in many clients have positive, lasting relationships with their readers. They only conduct readings by phone. This can be a pro or con depending on your personal preference. Readings by phone make it so that the experience feels anonymous. You might be more comfortable sharing with someone over the phone rather than in person if they don’t see your face. Unlike some psychic reading providers, they do not provide free readings for new customers. However they have reduced rates for new customers. They do not have email readings, online chat readings, or in-person readings available. If phone calls are your preferred method of contact, then California Psychics is perfect for you. If you would prefer a different way of communication, however, this company is not the one you need. Some customers complain that their readings were too vague. Some customers report being frequently put on hold. Their satisfaction guarantee policy does not include a full refund. The company will only place you with a new reader for an additional free reading if the customer contacts them within 24 hours. Both Psychic Source and California Psychics have satisfaction guarantee policies. The latter’s policy, however, does not give you a full refund. If you were unhappy with your reading and contact their customer service line within 24 hours, they will connect you with a new psychic for a free reading. Psychic Source, on the other hand, promises a complete refund if you are dissatisfied with your last reading. Both companies offer introductory rates of $1 per minute for new customers. Psychic Source, however, does not have their readers categorized by unique tiers. Each psychic’s profile picture has a five star rating next to it, but there is no option that allows clients to easily find a psychic at an experience level they are looking for. This company has introductory offerings for new customers. Some psychics offer either five free minutes or a discounted minutely rate. 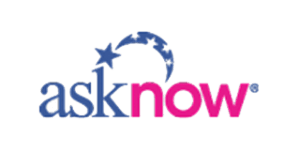 Unlike California Psychics, AskNow has readings available both over the phone and via online chat. AskNow has been in the business for a quite a while – 14 years! California Psychics, however, has been around for almost 2 decades. Their greater experience might be a contributing factor to their reportedly more accurate readings. For new customers, this online network offers the first three minutes of a reading free and 15% off the rest. They provide full refunds for unsatisfactory readings and specialize in a wide variety of topics. They offer readings via online chat, phone, and email. Giving their clients the choice of different communication methods allows them the opportunity to feel as comfortable as possible and get the most accurate reading they can. Kasamba, however, has fewer overall psychics. Their rates tend to be much more expensive. There is not a striking reason for the price difference, as their readings tend to have about the same levels of accuracy as California Psychics’. Final Thoughts: Is California Psychics Right For You? California Psychics is the perfect place to go if you are looking for guidance in your life. Although some occasionally some reported that they are too vague when it comes to their readings, this, can be dependent on a number of factors such as the person’s mood and attitude while receiving the reading. If you go into the reading with an open mind, you are bound to see results that are insightful and helpful. Especially when considering the introductory offers for new customers, California Psychics is well worth the investment. Their experienced psychics provide professional, friendly, and confidential service for reasonable prices.